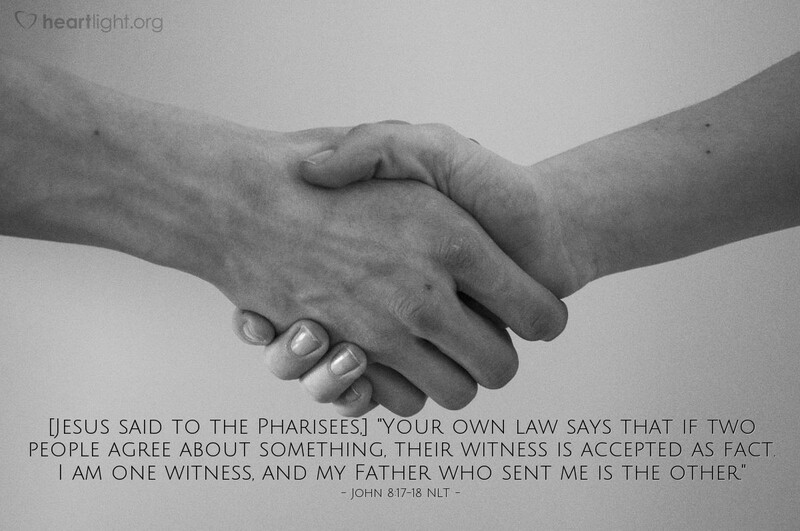 [Jesus said to the Pharisees,] "Your own law says that if two people agree about something, their witness is accepted as fact. I am one witness, and my Father who sent me is the other." What witnesses could Jesus call to prove he came from God? He needed two witnesses under Jewish law. He had more than two, but the first two are the most important. Jesus himself was a witness and so was his Father. Elsewhere in the Gospel of John, Jesus will list John the Baptist, his own mighty works, and even those who saw his miracles as his witnesses. However, only two witnesses really know that Jesus came from God — the Son and the Father. Once again, Jesus is pushing people to make a hard and definitive choice: Is he a blasphemer who is saying the unthinkable, or is he really from God? Jesus leaves us no middle ground. So what is your decision? Father in heaven, I confess that I often find it hard to make difficult and potentially life-altering decisions. I don't like them. I fear that I will make the wrong decision. But, dear Father, I really do want to honor you with all my heart and to live as a person of faith and integrity. So today I renew my decision to believe that Jesus is your Son and that he came as your presence in our world and showed us you in all your fullness. I trust him as my Savior and follow him as my Lord. I give you all thanks and praise, in Jesus' name. Amen.